77 years ago, the eve of Chinese New Year fell on February 14, 1942, but there was no celebration but sadness and anxiety. The streets were empty, shops had their shutters were rolled down, there were no reunion dinners, families were separated or broken and death was all around. It was barely 2 months since the Empire of Japan launched its surprise attack on Pearl Harbor and British colonial possessions in the Far East. Now, World War 2 had reached Singapore’s doorstep. Malaya had been overrun, and Japanese forces were amassing in the outskirts of Singapore’s urban core. 1 million people sought shelters at the city to await their uncertain future. Earlier the Japanese had already controlled the Bukit Timah Road’s approach into the city and heavy fighting had ensued in the Pasir Panjang area. Chinese New Year 1942 marked the Year of the Horse, but for the people of Singapore then, there was little hope for the new year but fear and trepidation. On February 15, 1942, which was the first day of Chinese New Year, Lieutenant General Arthur E. Percival, who was then the General Officer Commanding (Malaya), signed the surrender documents before Lieutenant General Tomoyuki Yamashita, Commander of the Japanese 25th Army that invaded Malaya on 8 December 1941. The meeting took place at Yamashita’s headquarters at the Ford Motor Factory along Upper Bukit Timah Road. 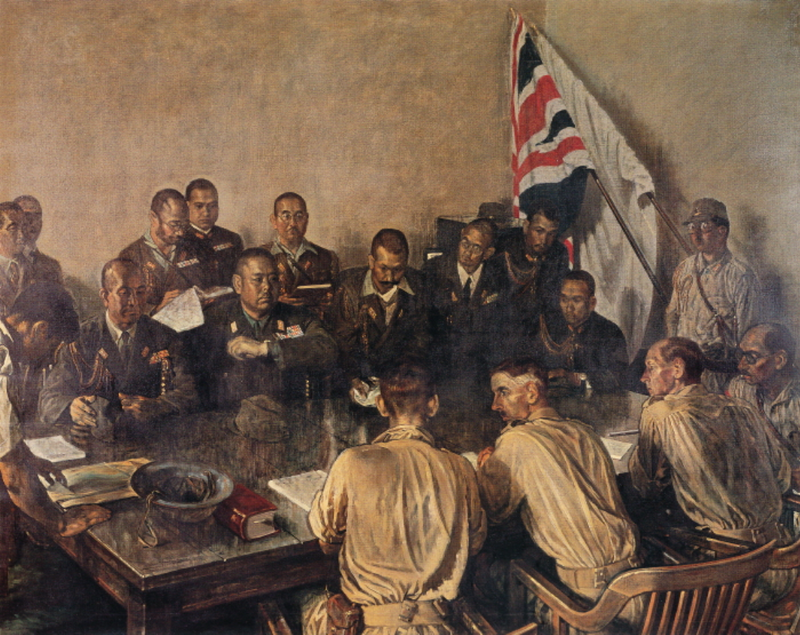 Upon convening the negotiations on the evening of 15 February with three other military officers, Percival tried to negotiate with Yamashita on some of the terms for the surrender of Singapore. Percival wanted to delay the ceasefire to ensure that all of his troops received their orders on time. He also wished to keep armed 1,000 men to prevent Japanese retaliation against the local population as had been witnessed in Nanking in 1937. Yamashita, who later described his attack on Singapore as “a bluff that worked”, feared the British were trying to buy time for more reinforcements from Australia and Borneo to arrive. He was particularly worried that the British might discover the truth about the actual situation of his troops. Japanese troops at the time were outnumbered by nearly 3 to 1 and were in critically short supply of ammunition. Yamashita threatened to proceed with the attack on the city planned for that night if Percival did not cave into his demands. Faced with the horrific prospect of urban combat and high civilian casualties, Percival signed the surrender documents. The surrender of Singapore was the largest capitulation in British military history and had profound implications for the future of the British Empire. 130,000 allied troops were taken prisoner. British prime minister, Winston Churchill, called it the “worst disaster” in British military history. The fall of Singapore effectively marked the point when Australia reconsidered its colonial relationship with Britain and looked increasingly towards the US for its future protection. 22,000 Australian troops were taken prisoner and 8,000 would die in Japanese captivity.